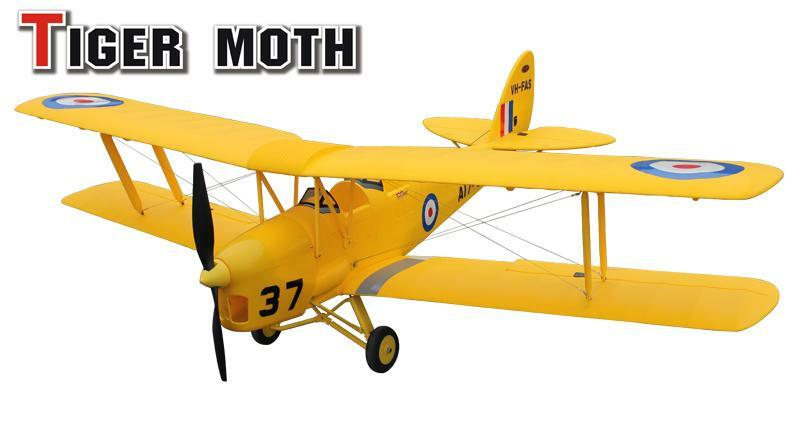 The Tiger Moth trainer model can be regarded as a legend in the aviation history. In the 30-40 years of the 20th century, most of the British and Commonwealth pilots were flying their first plane, a Tiger Moth. The pilots claimed the aircraft was easy to manipulate and felt secure. Some even mentioned that “you can fly it with your eyes closed.” The Tiger Moth will always be a remembered as a great plane and can be seen in museums or even out flying in the sky. This Dynam Tiger Moth is created with a classis appearance with vivid scale details. The wings span 50 inches long and the fuselage has an overall length of about 41 inches. Under the cowl you will find a 650KV brushless outrunner motor connected to a Detrum 40 amp brushless speed controller. The control surfaces are handled by 4 9 gram Dynam servos for precise movement. The entire electronics and power system is powered by a recommended 14.8v 2200mah lithium polymer battery for power and efficiency. The Dynam Tiger Moth is stable in flight due to the balanced center of gravity and bi-plane design. Pilot will find this model to be stable yet agile in its maneuvers allowing all skill levels to enjoy its flight. This almost ready to fly version comes with al the essential electronics installed. The servos, brushless speed controller, and brushless motors are all installed. Supply your own radio system and battery to complete the electronics required for flight.